Hygrocybe conica (Schaeff. : Fries) Kumm. Photo: Just beginning to blacken. Cap 2-9 cm broad, conic to occasionally convex, sharply umbonate, margin sometimes upturned at maturity; surface smooth to innately streaked, subviscid when moist, color variable: red, orange, yellow, to yellowish-green, bruising black and/or blackening in age; flesh thin, colored like the cap, blackening in age. Gills adnexed to nearly free, close, thick, waxy, pallid at first, becoming yellowish-olive to yellow, bruising black. Stipe 5-10 cm tall, 0.5-1.0 cm thick, fragile, equal, moist to subviscid, twisted-striate, white at the base, yellow to orange above, blackening when bruised or in age; veil absent. Spores 9-13 x 5.0-6.5 µm, smooth, elliptical, nonamyloid; spore print white. Solitary to scattered under conifers; in our area common under Monterey cypress and redwood; fruiting from late fall to mid-winter. Questionable. Not substantial enough to justify collecting for the table. This member of the waxy cap group is recognized by its distinctly conic cap, yellow to scarlet fruiting body, all parts of which bruise or blacken in age. Occasionally one will encounter all black, still relatively fresh specimens in the field. The white spores, waxy gills and flesh serve to separate this fungus from unrelated red-colored mushrooms. Hygrocybe singeri is very similar, but has a distinctly viscid stipe. Another blackening species is Hygrocybe nigrescens, which is distinquished from H. conica by a typically redder and less conic shaped cap and an oak woodland habitat. 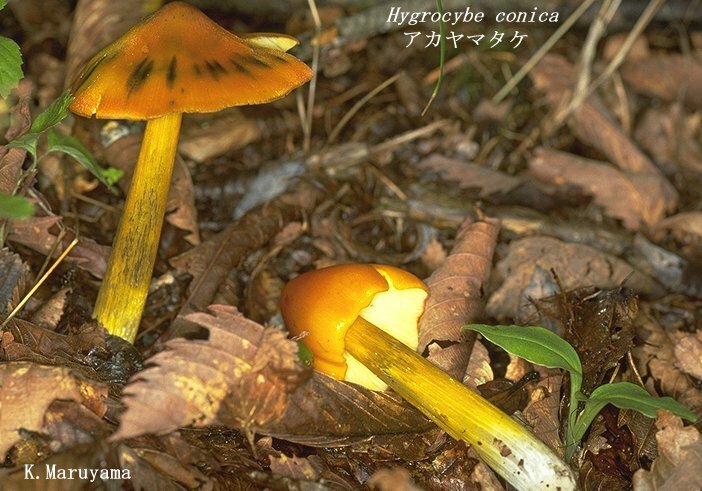 Hygrocybe acutoconica is also similar but does not bruise black. Young, A.M. (2005). Fungi of Australia: Hygrophoraceae. CSIRO Publishing: Melbourne, Australia. 179 p.